There is an unwritten law of turnout boots, as any barn worker will attest: the most difficult horses to handle will have the most difficult turnout boots to put on. 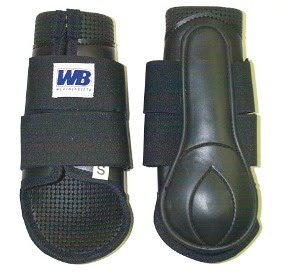 Several years and several barns ago, a very pleasant young boarder--Wendy--proudly held up the new splint boots she had purchased for her difficult thoroughbred mare. They were Weatherbeeta molded boots, an early versions of the ones the company makes now (before they did usability testing, perhaps). I stared blankly as the woman showed me how they are properly applied to the leg--it took several steps. What kind of boot requires explanation? Well, these did. And yuck, what a pain. I tried not to show my disdain as she explained the three-way velcro wrap, but meekly asked if Belle would stand still for them. Wendy paused. "Well, you'll have to watch out for her," she answered. Every week I turned on the stall lights to aid my efforts to put the WB boots on Belle. Kneeling down I would remove my gloves and hold them between my knees while separating the velcro pieces with my fingers so they didn't stick to each other prematurely. Meanwhile, Belle shifted away and cocked a hind leg in warning. The stiff material was not easy to wrap around the leg, and you had to maintain consistent pressure while wrapping the elaborate three velcro strap system or the boot would simply open up. Yuck! When Belle finally left the barn, I actually had a dream about her walking onto the trailer wearing those boots. It was a good dream. Years later another boarder, to whom I feel sincere gratitude, bought a pair of Toklat Valena boots for her very lovely, easy mare (Belle's Law, remember?). Vive la difference! They are a barn worker's dream and a joy to owners. Why? 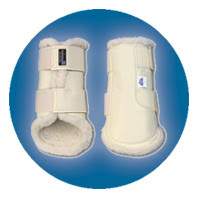 They are lined with wool fleece, which makes for a close, comfortable fit. The outer material is flexible, soft and durable. 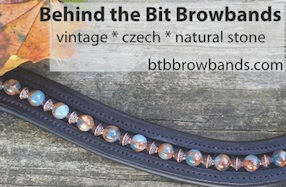 A smooth texture makes them easy to clean and returns them to a near new condition. Two big fat elastic straps supply the perfect amoung of give and tension -- they're easy wrap around the leg, and VERY hard to wrap too tightly. They last a looong time. The boarder I know has had hers for at least 3 years and they look great. They cost under $60 for front boots. They come in brown, white, or black. As Riley has started lungeing, I've been meaning to buy protective boots for him. Always one to see what's new on the market, I looked at 4-5 catalogs and evaluated boots. There was nothing better than Valena as far as I could tell, and I picked up a pair from VTO Saddlery recently. There is a purgatory (a wee one, only mildly hot, mildly punitive, and not very long in duration) for boarders who request that barn workers put on and take off pull-on bellboots for turnout . A nice alternative that we have in place at my current barn is to have horses wear the boots 24/7, but have staff flip them up for stall time and down for turnout. Works for everyone! ...People put boots on their horses for turnout? ...I must be more western then I thought! These boots are strictly for protection -- most horses don't travel perfectly straight with their legs, one leg may "wing in" as it moves forward -- it's called interfering. As they move they may hit one leg with the other. The boots protect the insides of their legs. I don't know of any boots that change a horse's gait, although there may be some out there. Hope this helps! Hi Stacey, thanks for answering my question. That's pretty interesting. I didn't even know that horses have that problem when they move. Thank God their are boots to protect the inside of their legs! ...the most difficult horses to handle will have the most difficult turnout boots to put on. So true! I believe this law may also apply to blankets as well. The horse I used to lease had those Weatherbeeta boots. Not sure if they're the exact same ones, but they look pretty similar. I actually loved those boots. I know what you mean about the velcro sometime being a little bit unmanagable, but on the plus side, the boots were extremely durable and NEVER came off. And that horse loved to chew off boots and wraps. (He primarily wore them for turnout). He'd already taken a couple of good chunks out and ripped a couple of the velcro pieces off, and they still stuck on. Wespi, this "Wendy" person is a horse woman I respect and admire -- there must have been something redeeming about the boots, even though it was totally lost on me. The boot version I'm talking about is probably six years old or more. I love valenas too :) So easy, and they're really pretty cute, too. Of course the one horse I've ridden this year who NEEDED boots was too small for the pair I had... oh well. That could be them then. I was leasing that gelding around that time.